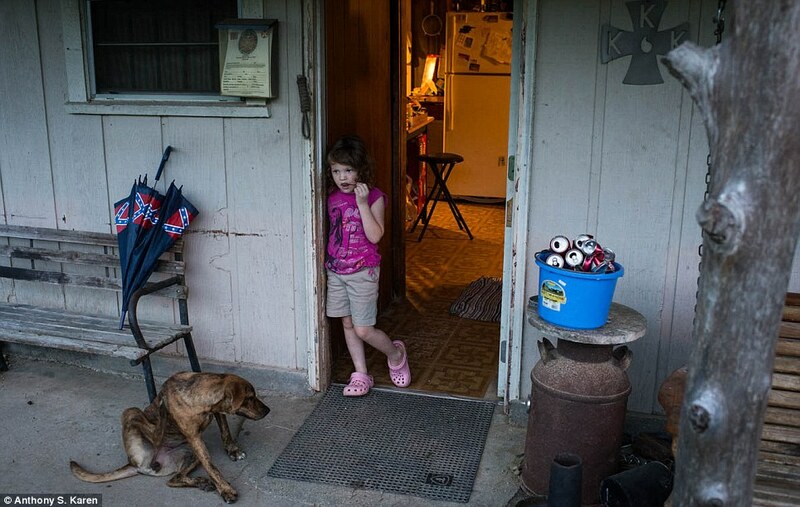 American photojournalist Anthony Karen is a man used to the margins of American culture. He has chronicled far-right extremists, the New Black Panthers and even members of the widely-reviled Westboro Baptist Church. 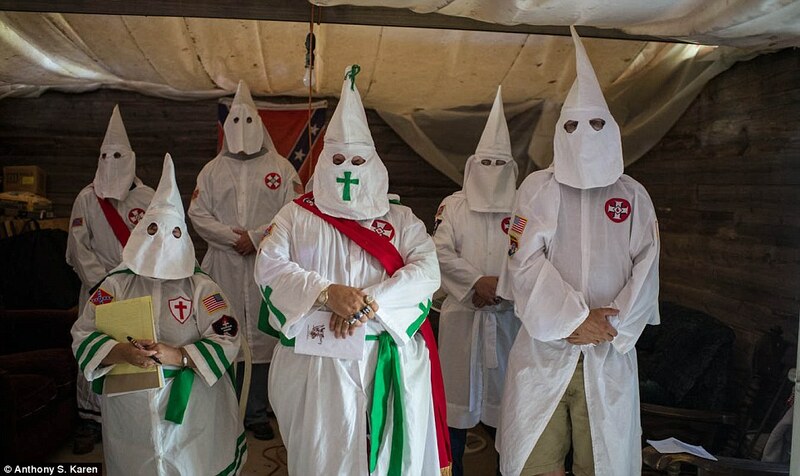 Now he has created an astonishing visual record of the Ku Klux Klan, a white-supremacist organisation known for its white robes with conical hoods. 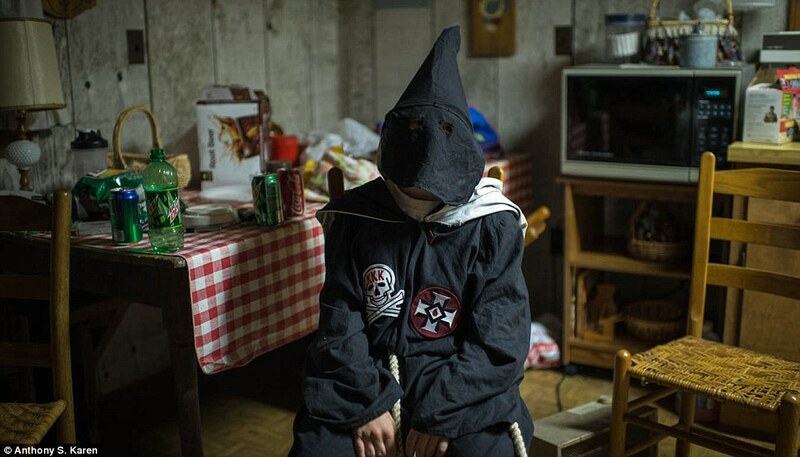 He gained the trust of KKK members and was able to capture them in candid, unguarded situations that give a unique insight into the world they inhabit. 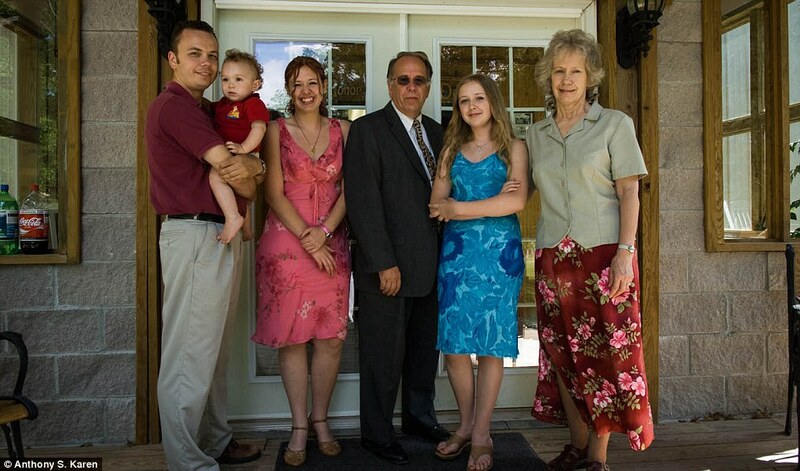 The New York-based photographer said that despite their horrific beliefs they came across as normal people in their day-to-day lives. He recalled meeting one Klansman shortly after he started the project that worked as an engineer on a nuclear submarine. He said: ‘The majority of the people I’ve come across are no different than somebody living next door. 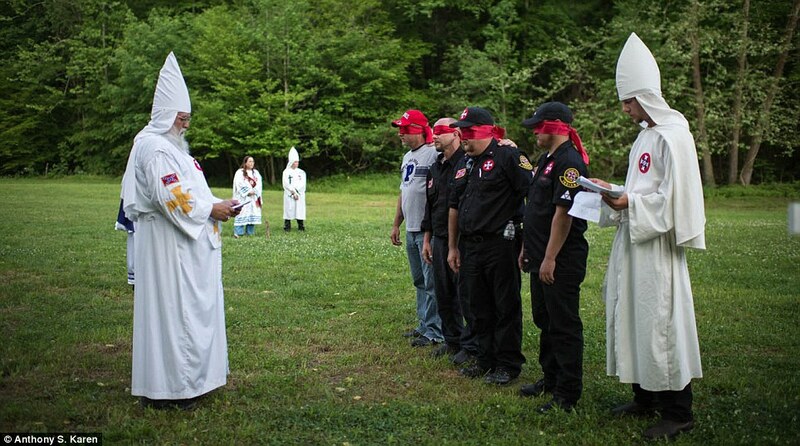 You’d only know they were in the Klan if they decided to share that with you, had a distinguishing emblem on a tee-shirt or a racially-themed tattoo. For a secretive and suspicious group wary of outsiders, earning their trust was no easy task. He says he did it by being completely impartial. Mr Karen, who served as a Marine in his 20s and later became a bodyguard, said: ‘You need to give some of yourself in order to receive something back. I spend time with people, I listen to what they have to say and I treat each person as an individual. I don’t have to believe what they believe but whenever I’m in someone’s space, I feel I’m obliged to observe without judgment. ‘Over the years, these organisations and the people I encounter have also seen how I work – I’m respectful of people’s privacy, I’m polite and I’m focused. 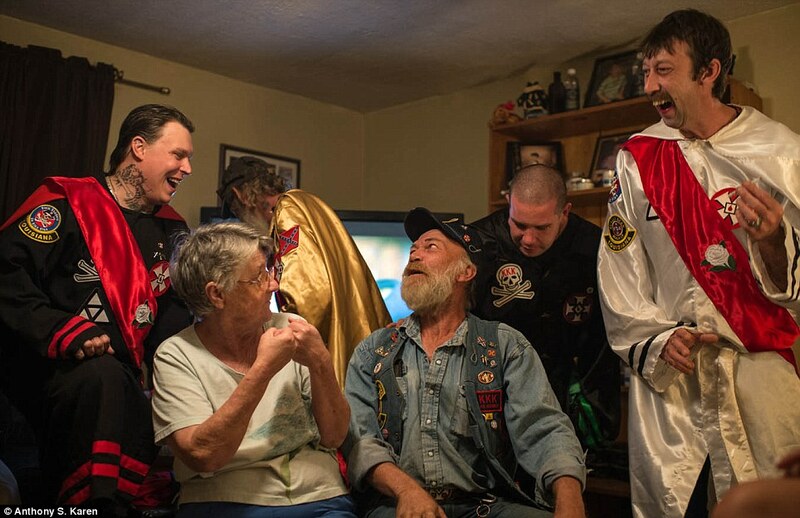 As well as photos of their costumes and rituals, the photographs show KKK members in their kitchens, sharing a joke and day-to-day family life. 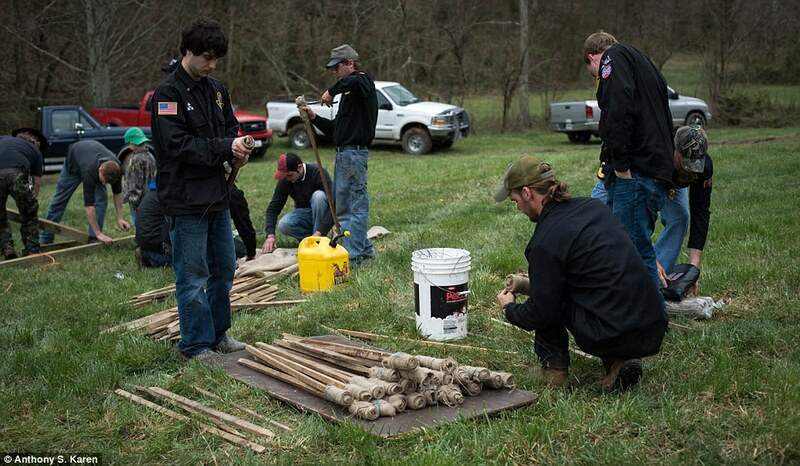 Members of the group, originally formed by Confederate veterans in the aftermath of the American Civil war, have committed numerous racially-motivated murders and assaults over the past century. They advocate the seperation of the races, claiming interbreeding between ethnicities goes against God’s will (religion is a key part of their beliefs). In the 1920s they reaches the peak of their power, with as many as six million members. Today they are estimated to number between 5-8,000. One of the group’s most famous crimes was the murder of three American civil rights’ workers, James Earl Chaney, Andrew Goodman, and Michael Schwerner, who were shot in June 1964 by members of the Mississippi White Knights of the Ku Klux Klan, the Neshoba County’s Sheriff Office and the Philadelphia Police Department located in Philadelphia, Mississippi. The three had been attempting to register African Americans to vote. The FBI called its investigation ‘Mississippi Burning’ – which was later used as the title for a 1988 film loosely based on the case. Among the others charged with conspiracy in 1967, seven were convicted. None served more than six years in prison. The unassuming nature of the pictures has led to accusations that his work gives the Klan publicity, a claim he strongly refutes. 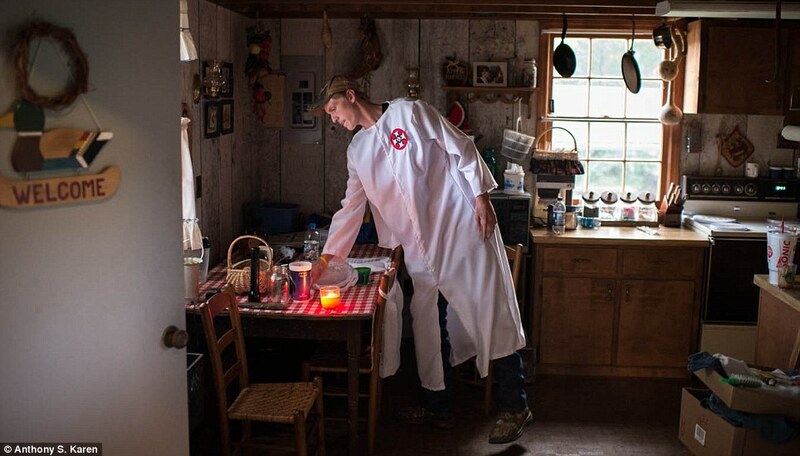 ‘If a person was finding him/her self wanting to join the Klan after viewing my images, one would logically come the conclusion that this is something they supported long before these images came along,’ he said. 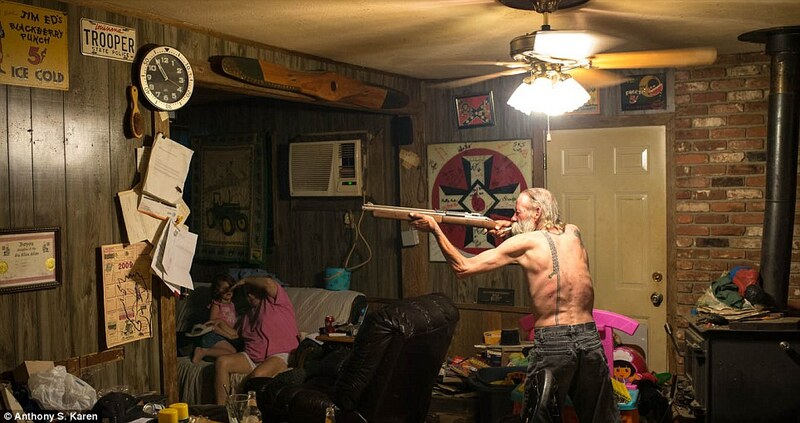 ‘I prefer to document the Klan at home as opposed to the typical imagery that most anyone can get during a public demonstration. 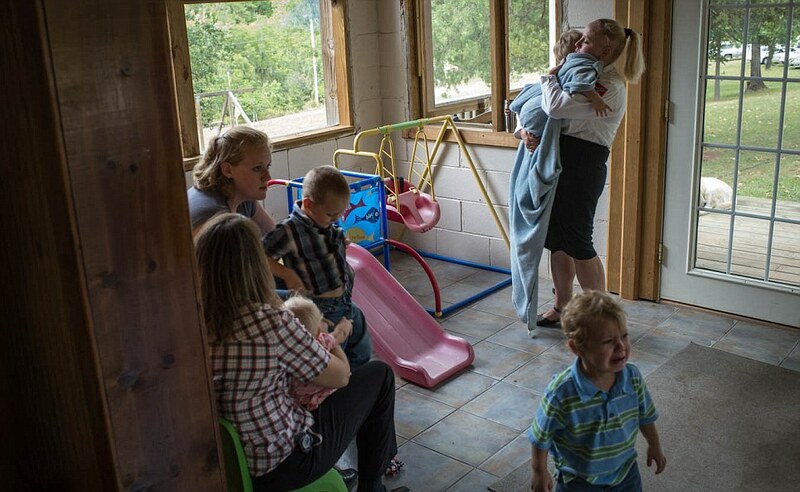 Yes, I’m trying to show the viewers the way certain people who’ve adopted such beliefs live – they may drink soda, cook and put family photos on the wall just like the rest of us. 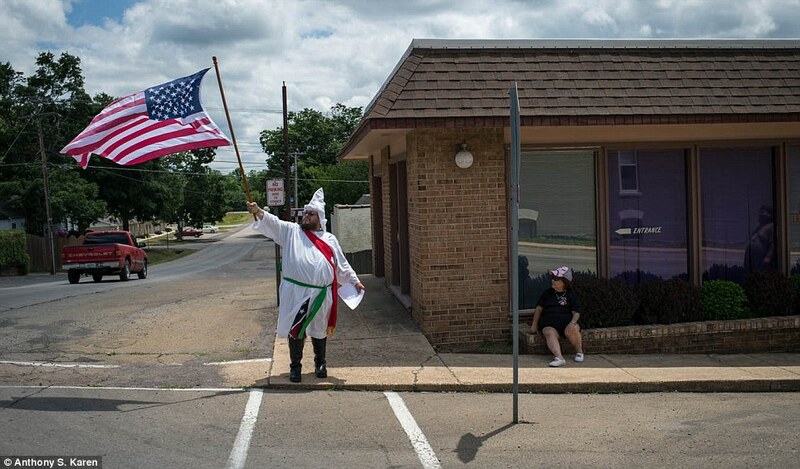 ‘I’ve witnessed just as much verbal hatred in conversations amongst non-Klan members. I’m not trivialising anything; I’m showing things exactly how I’ve observed them. ‘The project is on the Ku Klux Klan, which alone should offer enough innuendo as to the back-story. My objective is to present a project that’s been covered a million times before, but in a non-typical and intimate light… no other rhyme or reason. 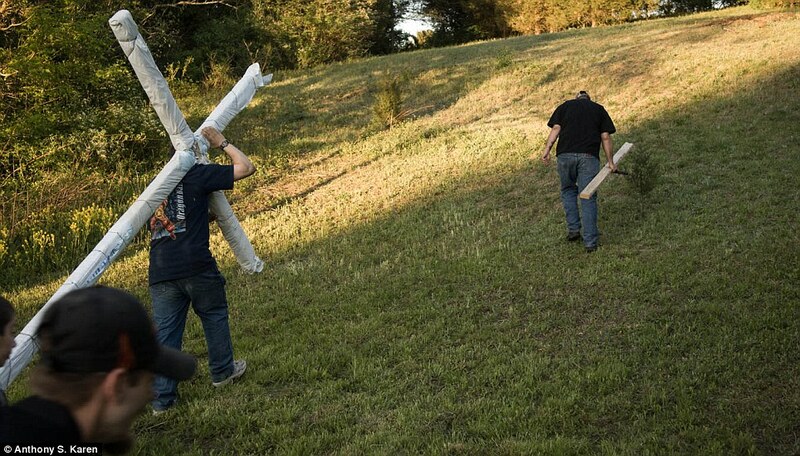 Surprisingly, given the Klan’s reputation for violence, Mr. Karen says he has never encountered any hostility from members, although he admits to one situation where a small group of drunk racist-skinheads were ‘getting on (his) last nerve’ during a Klan weekend gathering. 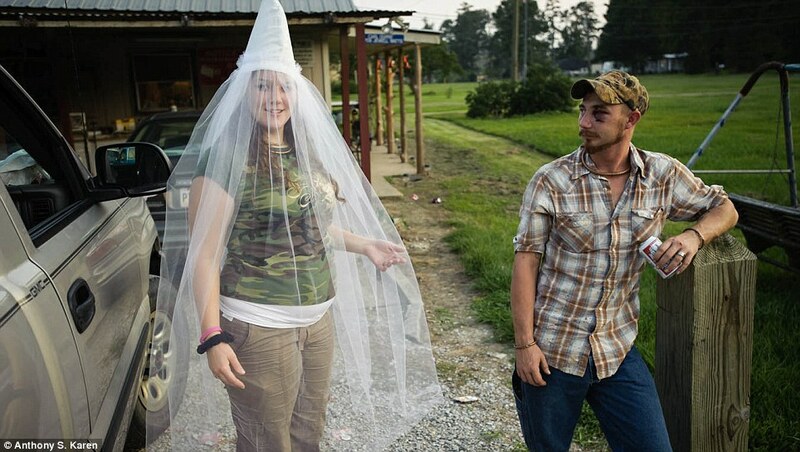 Mr Karen achieved an extraordinary closeness with Klan members. Did he ever feel too close, too friendly, to them? ‘Whenever you’re granted access into a person’s intimate space, you’re establishing a relationship based on trust. In my opinion, trust is trust. That doesn’t suggest I become complacent with my situation to the point of exploitation, nor does it mean I’m selectively disregarding certain moments to depict something that is not.